Re-take of Amrita is a book of digital photomontages by Vivan Sundaram, including a foreword by Wu Hung and an introduction by the artist. These montages are the result of a ‘collaborative’ photographic project, between Umrao Singh Sher Gil (1870-1954), the ‘essential’ photographer who took numerous self-portraits, and Vivan Sundaram, who orchestrates these archival photographs with a digital wand. Vivan Sundaram enters the space of the Sher Gil homes and makes the members of the family enact (and re-enact) moments of radiating desire under his direction. The encounter generated in this process of recasting the family in new roles elaborate into a fictional narrative. The central axis of the ‘cinematic plot’ is the relationship between the father Umrao Singh Sher-Gil and the artist daughter Amrita Sher-Gil (1913-1941). 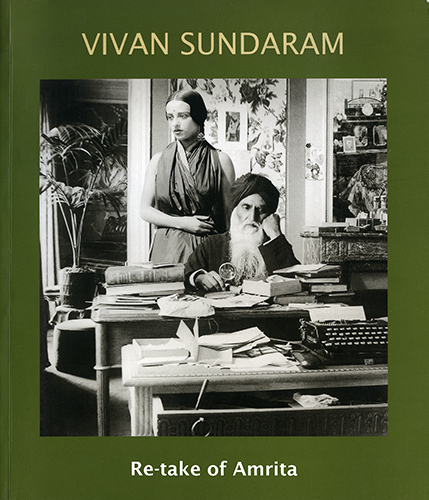 Vivan Sundaram was born in Shimla In 1943. He studied at the Faculty of line Arts, MS University of Baroda, and at the Slade School, London in the 1960s. He returned to India in 1970 and continued his painting. Since 1990 he has turned to making artworks as sculpture, installation, photography, and video. These works have been widely exhibited nationally and internationally as for example The Johannes burg. Havana and Kwangju Biennales and the Asia-Pacific Triennale. In 2006 was shown at the Seville Biennale. Sundaram has organized international artists’ workshops, curated exhibitions, and done public art projects. He is an active member of SAHMAT, a cultural-activist group based in Delhi. Vivan Sundaram, himself a member of the Sher-Gil family, has been engaged with the Sher-Gil project over a thirty- year period, as curator, editor, archivist. The painting, The Sher-Gil Family, (1983-84) and an installation The Sher-Gil Archive, (1995), are precursors to the present work. Re-take of Amrita, a series of digital photomontages were made in 2001 and extended in 2002, (the second lot is published for the first time in this edition). These have been exhibited in over twenty-five cities world-wide. Some of the locations include Museum Boijmans van Beuningen, Rotterdam; Galeire du Jour, agnes b, Paris: Photographer’s Gallery. Copenhagen Gallery 44, Toronto: Walsh Gallery, Chicago; Asian Civilizations Museum, Singapore and the Shanghai Biennale. In 2006 they were exhibited at Sepia international and The Alkazi Collection, New York; Museum of Modern Art, Ludwig Foundation, Vienna: Haus der Kunst, Munich and the Tapei Biennale. Thirty photographs from this series are part of the book Amrita Sher-Gil: An Indian Artist’s family in the Twentieth Century, Munich: Schirmer/Mosel, 2006. Vivan Sundaram lives in Delhi and is married to the art writer Geeta Kapur.